The Collinsville City Commission met Wednesday, Sept. 22th in special session to address the resignation of City Manager Mike Tinker. Tinker will be returning to Jenks as their Assistant City Manager. 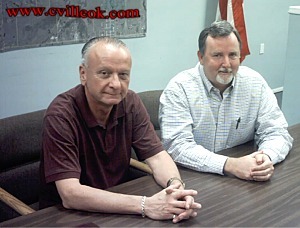 Mr. Tinker had formerly been the Mayor at Jenks and became Collinsville's City Manager Jan. 6th 2003. Following a lengthy executive session the commissioners named City Planner Bob Wolfram as Assistant City Manager during Tinker's final 30 days here. After Tinker's departure, Wolfram would become the interim City Manager while the city searches to fill the position. Commissioner Gail Rogers' was the lone negative vote on the motion to appoint Wolfram. Newly appointed Assistant City Manager Bob Wolfram (left) sits with exiting City Manager Mike Tinker (right) after the City Commission Meeting Wednesday Sept. 22, 2004.